Net Talent...What is "Net Talent?" Like Net profit, or Net loss...Net Talent is a superior way to measure and predict employee performance. It is the strength of one's strengths impacted by the strength of one's performance blockers. Since EVERYONE has natural strengths and EVERYONE has natural PERFORMANCE BLOCKERS...for the first time ever, there is a scientifically reliable way to measure "NET TALENT"...and the probable performance that it will produce! "The Bus Concept tools are the best we've ever seen. We don't make a hire without them." "We use the Employability Screen as the first step for every candidate we think would be a good fit for us." If You think you can see behind a Candidate's Interviewing Mask...You're a better interviewer than we were!" "These tools are simply amazing. We are recommending them to our business associates." The Bus Concept™ is different. We're experienced Behavior Analysts. We combine 15 years of Selection, Development, Leadership Training, & Teamwork experience with these Revolutionary Performance Tools that are built upon Nobel Peace Prize nominated research plus 30 years of ongoing validation, application and translation into these modern business models. Our efforts are clearly focused on bringing our clients a series of tools that will enable them to ALIGN the talent within their organizations with their Strategic Business Plans. Our clients tell us time and time again that they WANT to optimize the talent in their organizations and they certainly WANT to USE those talents in an effective way...but they are not sure exactly HOW TO DO THAT. That's where we come in. We'll show you how to do it...We'll demonstrate the process for you at no charge...and you will see the results immediately. Identify the core issues that are driving a problem, challenge or opportunity. Create a workable solution for the identified core issue(s) needing attention. Implement the workable solution that respects the guidelines of the organization and within the scope of the resources that are currently available to the individual. The Bus Concept™ answers those 3 critical questions with scientific precision. The tools we use for this aspect of the Employee Lifecycle are discussed below. 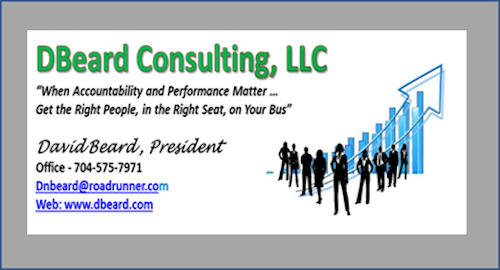 Would you be interested in Finding the ANSWERS to the 4 Critical Performance Questions that Support SUCCESS in Virtually EVERY Role? Will this candidate WORK EFFECTIVELY with customers, co-workers and managers? Will this candidate REMAIN ENGAGED AND EFFECTIVE when under stress and pressure? Can this candidate PRIORITIZE their workplace activities and responsibilities? Will this candidate be PERSONALLY ACCOUNTABLE for their own actions in the workplace? 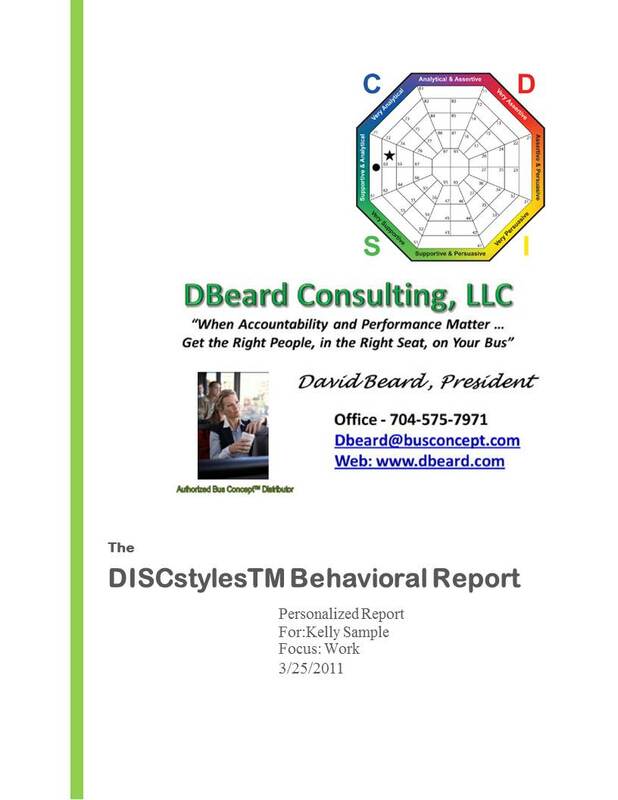 Your summary will report on the DISC Behavioral Style the candidate will display to your customers, co-workers and managers. We report specifically on HOW the candidate’s overall WORK ETHIC will be shared, delivered or displayed to other people. 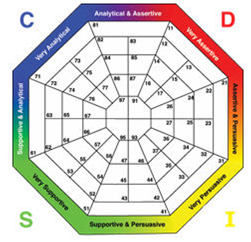 This behavioral style is measured via the world class DISC behavioral tool. 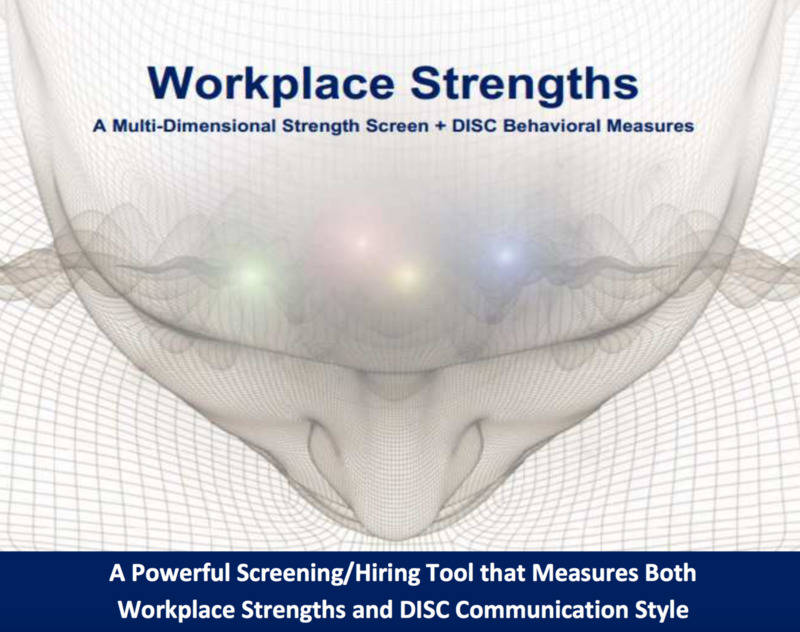 DISC is a supportive and incredibly reliable and powerful measurement that blends beautifully with the work ethic screen to identify HOW this person will interact and communicate with others. It identifies how assertive, outgoing, patient and precise this candidate will be as they apply their work ethic in the pursuit of your organization’s day to day operations. We then provide a hiring recommendation for your consideration. The Initial Work Ethic Screen© provides you with the distinct advantage that enables you to determine if a candidate’s credentials are supported by a strong work ethic BEFORE you move them into the final selection process. (1) Candidate Eligibility: You review the candidate’s credentials to determine if they have the education, experience, certifications, track record of DOCUMENTABLE RESULTS, job stability and specific training(s) needed to do this job. (2) Candidate Suitability: We provide the Work Ethic Multiplier to determine if the candidate has the generic work ethic multiplier that is highly desirable in virtually every job? (3) Determine if the combined credentials AND work ethic multiplier is strong enough for the candidate to be considered a finalist. 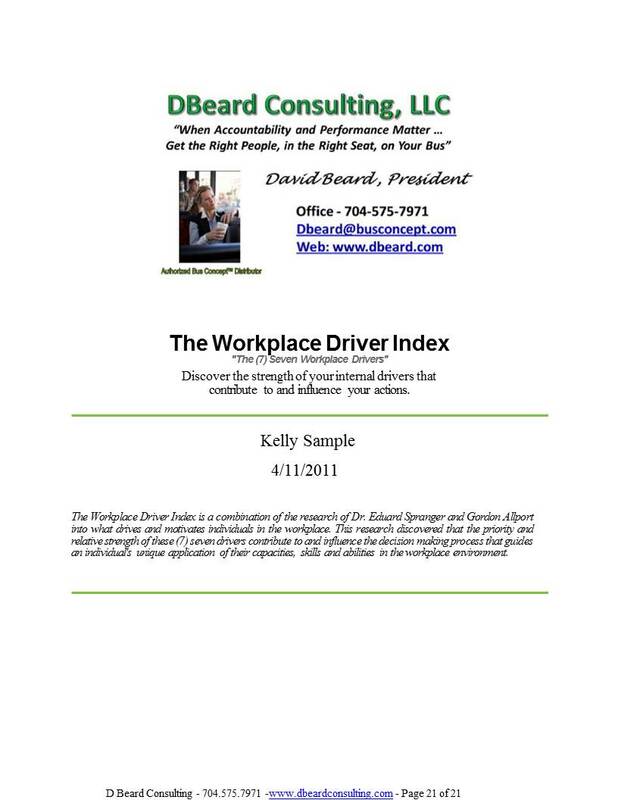 "The (7) Seven Workplace Drivers"
contribute to and influence your actions. Conceive a workable solution to the problem, challenge or opportunity? Implement their conception (workable solution) to the problem, challenge or opportunity? 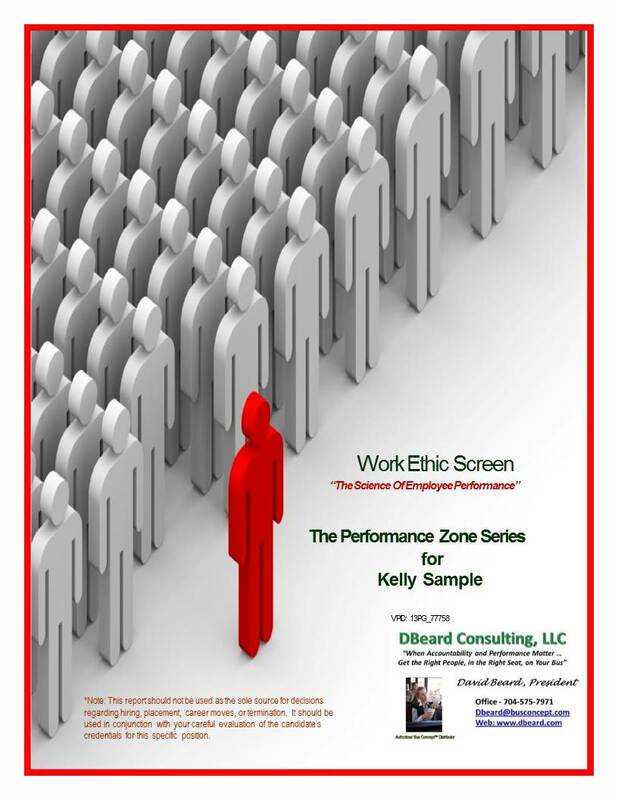 The tool we use is the Performance Zone Report generated from the same initial survey. Following is an overview of the Performance Zone Report. 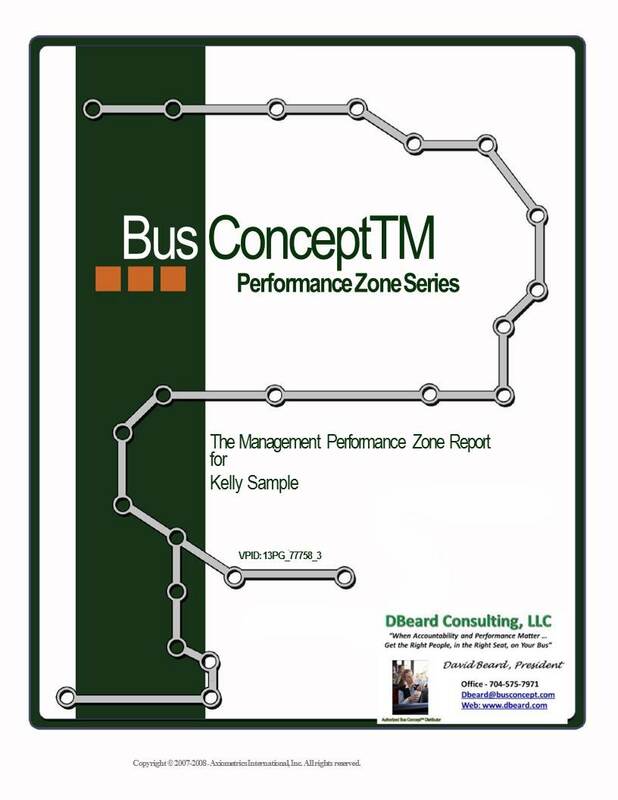 The Bus Concept Scorecard is the "Missing Ingredient" you'll want to use in order to get the right people on your bus and then put them in the right seats. Actually putting the right people in the right jobs will rocket you ahead of your competitors. It is simpler than you might think and the cost makes it a no brainer. Contact us for your complementary demo.